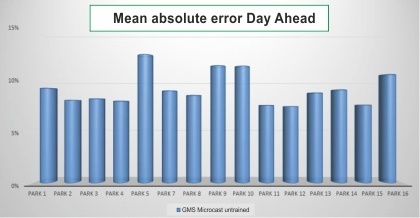 AL-PRO has developed a mesoscale weather prediction model delivered with our new GLOBAL MICROCASTING SYSTEM-GMS, a system that includes a self learning component to improve turbine specific forecasts. 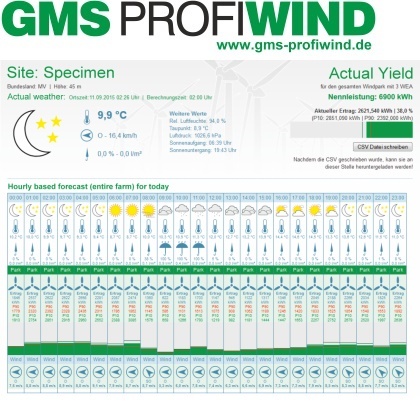 GMS PROFIWIND is a product specifically tailored to the needs of the wind industry with detailed forecast data for the boundary layer which include precise wind speed, direction and gust data. The forecast data is so precise, that implementation within pilot sites situated in complex terrain has shown very small variations in regards to wind flow and yield forecasts. GMS PROFIWIND provides hourly or finer wind, wind yield and weather forecasts with a very high accuracy for several days. provides detailed, hourly wind forecasts at different heights and is suitable for scheduling construction or maintenance for wind turbines. expands on GMS PROFIWIND BASIC with the use of GMS YIELD PREDICTOR – a process which models various types and models of turbines. GMS YIELD PREDICTOR simulates wind fluctuations and turbine induced turbulence at an hourly resolution for a wind farm and allows for detailed yield forecast for individual turbines or combined for an entire wind farm. 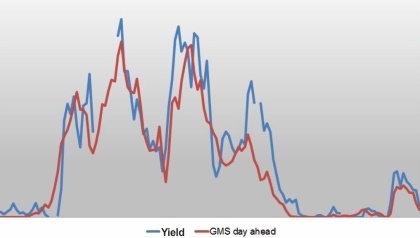 is a wind and yield forecast which includes GMS PROFIWIND SMARTYIELD – a yield forecast based on neural network algorithms that learn from forecast deviations and correct them automatically, with significant improvements in yield forecasts.